Who better to speak out against the destruction of the rain forests than their urban relatives. Oro Verde, a German nonprofit with only 10 full-time employees needed to recruit new activists and volunteer donation collectors to help increase the number of cash donations. Instead of recruiting human beings, who are far too busy tweeting and updating their facebook statuses, they looked to the trees themselves. 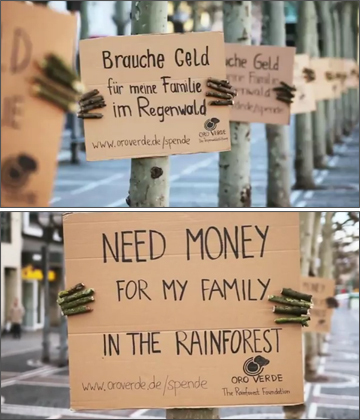 Hundreds of trees in Germany’s outdoor pedestrian malls and parks were ‘outfitted’ with cardboard protest signs that read, ‘Brauche Geld für meine Familie im Regenwald’ (Need Money for my family in the Rainforest). The addition of wooden fingers that appeared to be holding the signs completed the striking illusion. 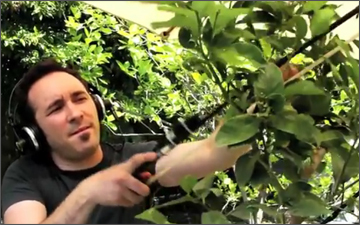 To celebrate Earth Day, Burt’s Bees got together with Italian sound designer Diego Stocco to create the composition ‘Music From Nature’. Diego creates his music using experimental recording techniques and custom built instruments. His composition ‘Music from a Dry Cleaner‘ featured Diego creating the music using the equipment in the dry cleaning shop as instruments. In this Earth Day collaboration, Diego creates the composition using all natural elements including the ingredients from Burt’s Bees products. He taps away on a tree, flicks at the bark, shakes a handful of almonds and even uses a violin bow on a tree. The ‘Music from Nature’ project was thought up by the creative folk at Raleigh agency Baldwin&. UK home improvements store Homebase is all about transforming unusual spaces into inspirational places. 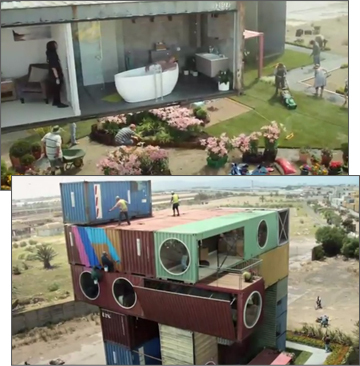 To demonstrate the style and creativity of their products, they constructed a 10-storey home made entirely from fifty shipping containers. The commercial features construction crews assembling the containers to the tune of Peter, Bjorn & John’s ‘Young Folks’ as decorators make their final touches to the interiors. (whistling while you work?) The lawns are rolled out, flowers are planted, balconies are opened, drinks are served and the vinyl is spinning. Creating a living space from a shipping container may not be such a far-fetched idea. This article on WebUrbanist shows shipping containers being used for everything from homes, to offices, to a complete hotel. The campaign was created by Leo Burnett UK. Gowalla has been overshadowed recently as Foursquare (and Facebook Places) steal most of the attention within the location-based service world. It’s user base is hovering around the 1 million mark while Foursquare reported it had 9.3 million users in mid-may. The lack of attention is unfortunate as Gowalla seems to be less focused on commerce and more on fun and sharing interesting experiences with friends and other users. 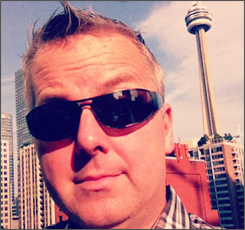 Users can create and share their own trips featuring customized badges and rewards. The Scott Pilgrim vs the World trip is a favorite trip here in the Toronto-area, featuring locations seen in the movie. With this focus on it’s users and their communities, it’s wonderful to see Gowalla announce a partnership with Frigidaire to promote Farmer’s Markets across America. It’s all in support of the appliance maker’s Make Time for Change program. Starting this week, when Gowalla users check-in at their local Farmer’s Market, Frigidaire will donate $1 to Save the Children as part of their larger $500,000 commitment to the cause. Make Time for Change spokesperson Jennifer Garner has already checked in at Brentwood Village Farmer’s Market. 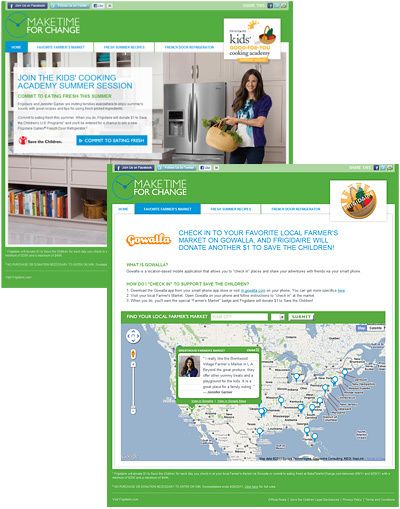 In addition, Frigidaire will also donate $1 to Save the Children for every person who makes a commitment to exercise and better eating at their Make Time for Change website. People who register through the website are eligible to win a Frigidaire Gallery French door refrigerator. The campaign uses Frigidaire’s Facebook and Twitter accounts to spread the word. If you haven’t tried out Gowalla, download it and give it a try. It’s available for iPhone, iPad, Android and Blackberry. This week Nissan released this funny 60-second spot for the electirc-powered Leaf. Nissan imagines a world where everything runs on gasoline. Well if you live here in Ontario most of your electricity is coming from nuclear and hydro, as you can see in these charts that show us where our electricity is coming from this hour. Watching the technician check the oil in the photocopier and the laptop being filled with gasoline from the converted watercooler are particularly funny moments. Did you notice the ‘not-so-subtle’ jab at the Chevrolet Volt hybrid? The Volt owner stands at the gas pumps and looks longingly as the Leaf drives by. While the building of infrastructure for the recharging of electrical vehicles is still in the early stages, it’s satisfying to see these cars starting to reach the streets.